When the stock market crashed in 1929, the fine folk of Washington State weren’t initially too concerned. Seattle was no Wall Street, after all. It was full of logging people. Sawmill people. And its business was extracting resources and shipping them off. But by 1930, banks were closing, jobs were scarce and panic had begun to set in amongst the locals. Because the federal government provided no unemployment insurance, many Seattleites who lost their jobs during the Great Depression also lost their homes and fell into extreme poverty. As a result, the moist, scrappy folk of Seattle began setting up tent camps and shack towns. 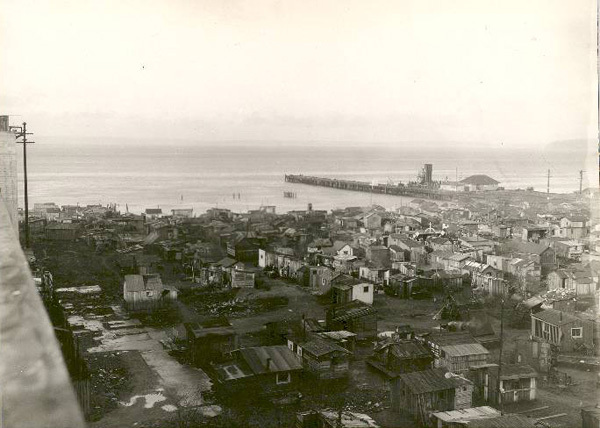 One large encampment that residents called “Hooverville” — in honor of President Herbert Hoover, who they blamed for their troubles — grew in the mudflats south of downtown Seattle near Elliott Bay. Hooverville had a population of up to 1,200 and even had its very own unofficial mayor. 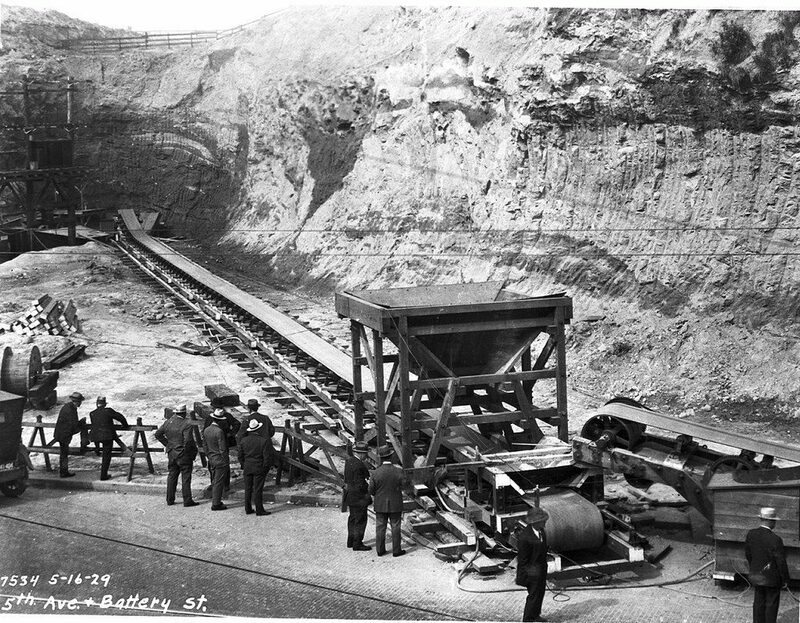 The first white settlers in Seattle were dead set on flattening the landscape, and from the 1890s to the late 1920s used pick axes, water cannons, steam shovels and conveyor belts to flatten Denny Hill. 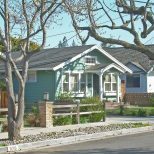 Two regrades took place during that time, with the second one finishing in 1930 just as the Great Depression was hitting the area. Much of the displaced earth generated during regrading at Denny Hill was used for filling in tidal flats on the waterfront. 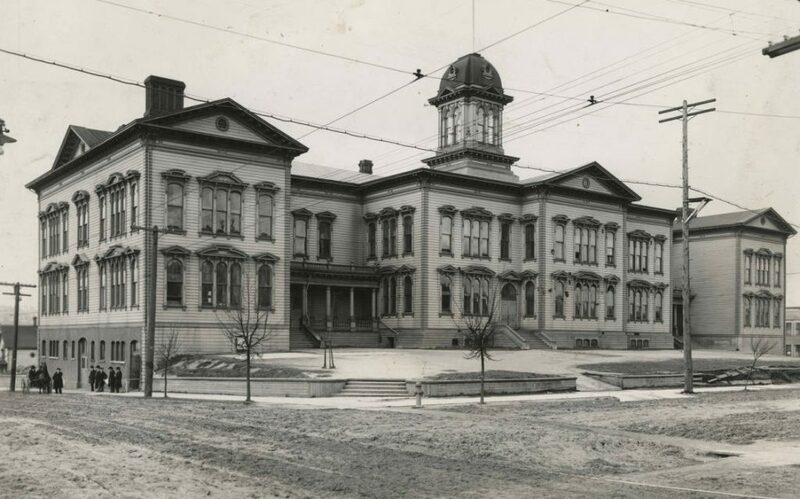 One of the buildings demolished in the second regrade was the Denny School, located on Battery Street between 5th Avenue and 6th Avenue. The Denny School was an architecturally interesting school erected in 1884. Residents were sad to see it demolished in 1929 at the hands of ambitious city engineers. 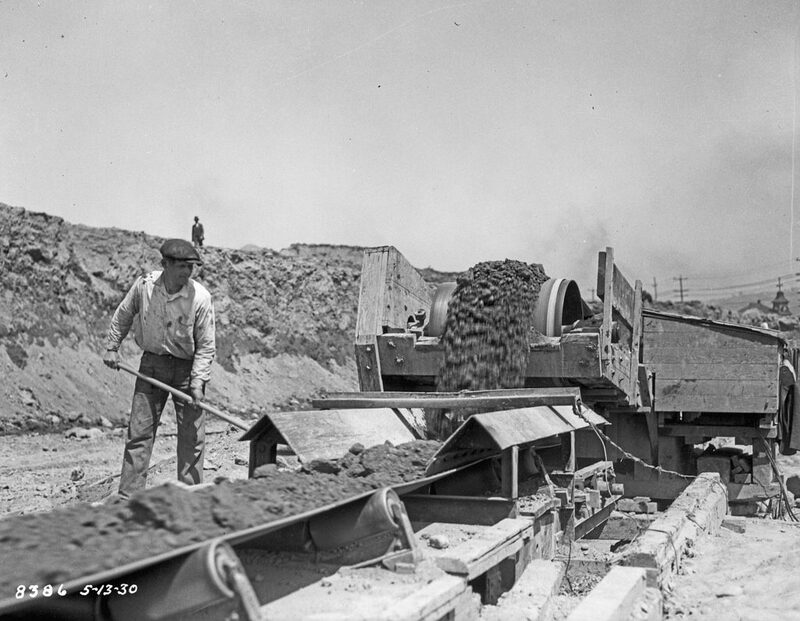 Franklin D. Roosevelt was elected as US president in 1932, beating out Hoover, and one of his first initiatives was the Public Works Administration; it funded large-scale construction projects and provided skilled workers with jobs. In Washington State, over 54,000 people were at work repainting county buildings, fixing roads, making clothes for the Red Cross and clearing land by the end of 1933. 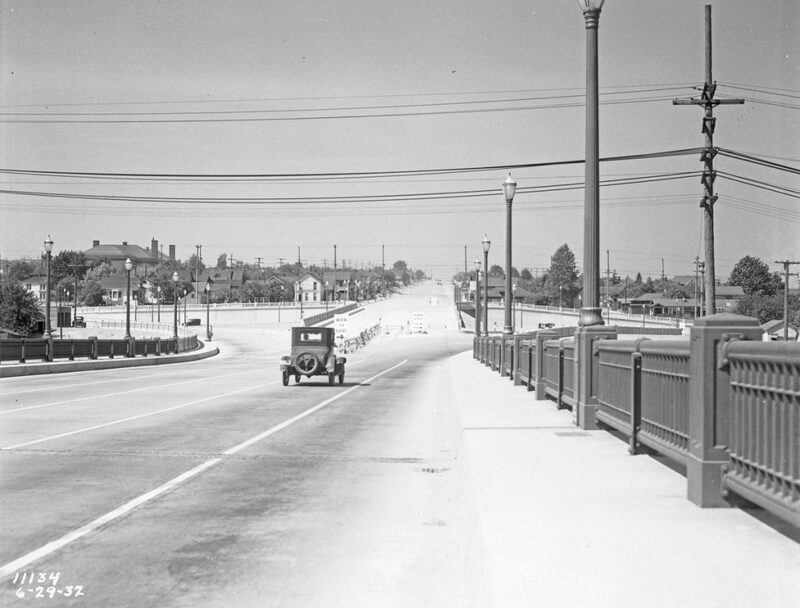 Not too much traffic on the Aurora Bridge back in 1932. 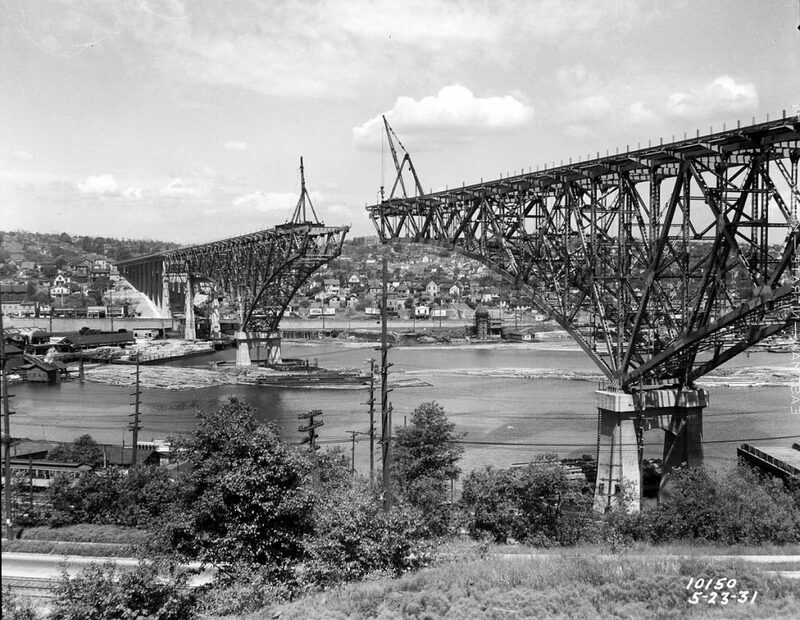 Another gorgeous creation to emerge during the Great Depression was the West Garfield Street Bridge. 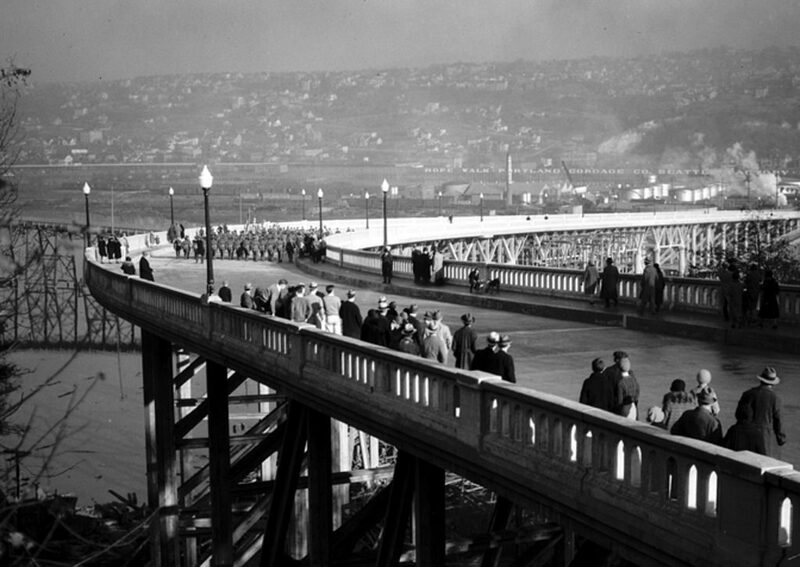 Now better known as the Magnolia Bridge, the structure was built in 1930. 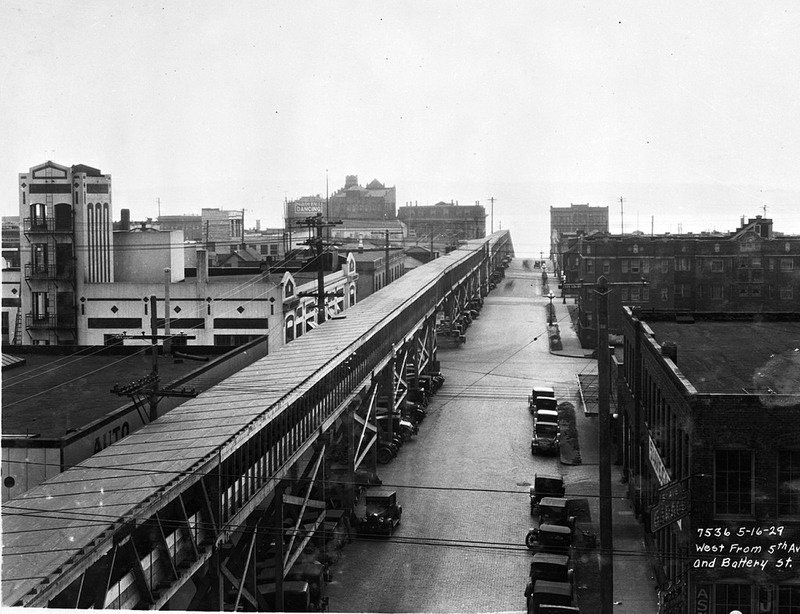 The bridge connects Seattle’s Magnolia and Interbay neighborhoods over the filled-in tidelands of Smith Cove. It is one of only three road connections from Magnolia to the rest of Seattle. According to KCTS, the national New Deal Federal Theater Project (1935 to 1939) provided jobs for unemployed individuals in the performing arts profession through various theater companies. Part of the project was called “Living Newspapers,” and it featured local events acted out in front of an audience. The touring companies formed in Washington were some of the most beloved in the nation, and this new wave of arts in the Pacific Northwest is thought to have helped pave the way for Seattle’s lasting identity as an arts-centric community. The Hotel Butler began operating in 1903. 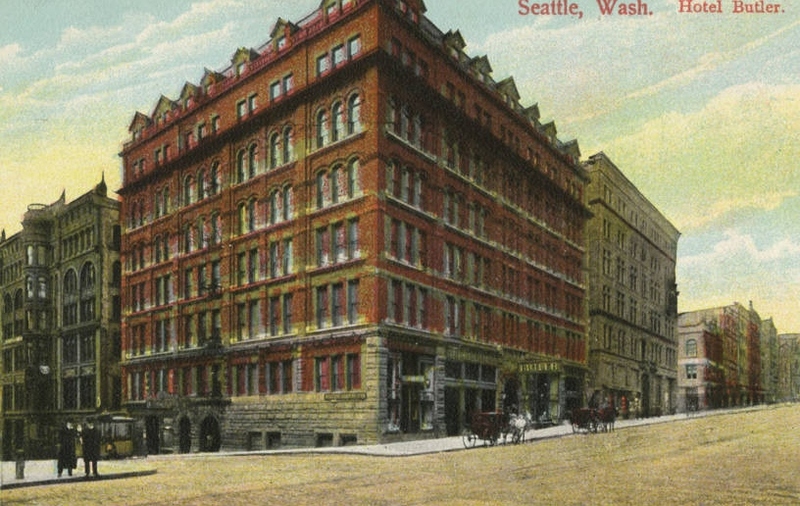 The hotel gained a reputation during the Prohibition era for ignoring laws against alcohol. 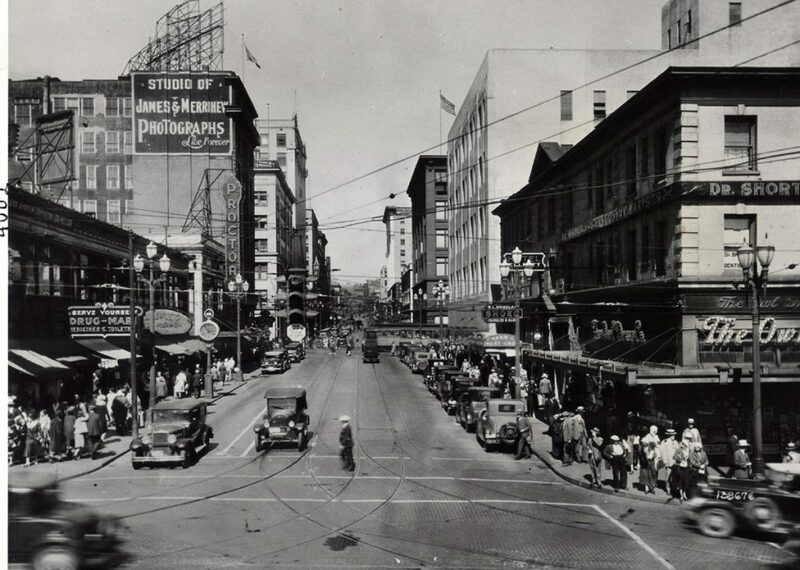 The Great Depression forced it to close its doors in 1933, and now all that remains are the lower two floors of the building, which were converted into a parking garage. In the summer of 1927, the Seattle Board of Park Commissioners authorized funds to build two greenhouses to grow bedding plants for all of Seattle’s parks. 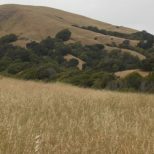 The funds supported 60,000 plants a year at a total cost of $16,000. 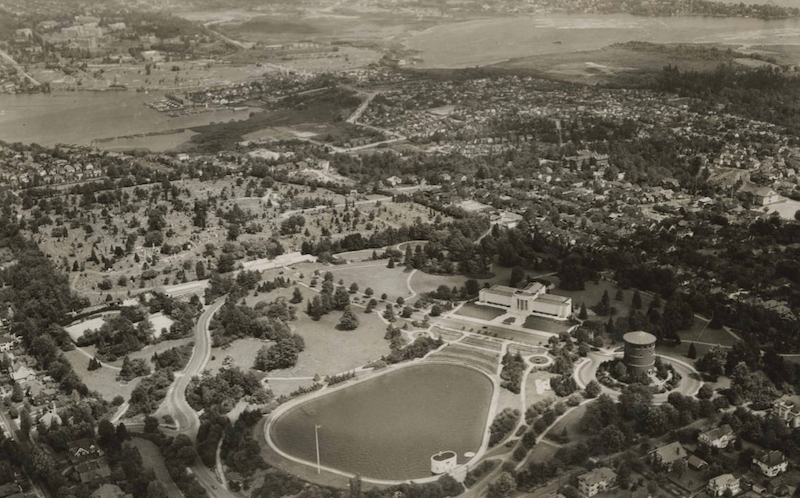 Magical Volunteer Park was one of the beneficiaries of this growth before the Great Depression hit. 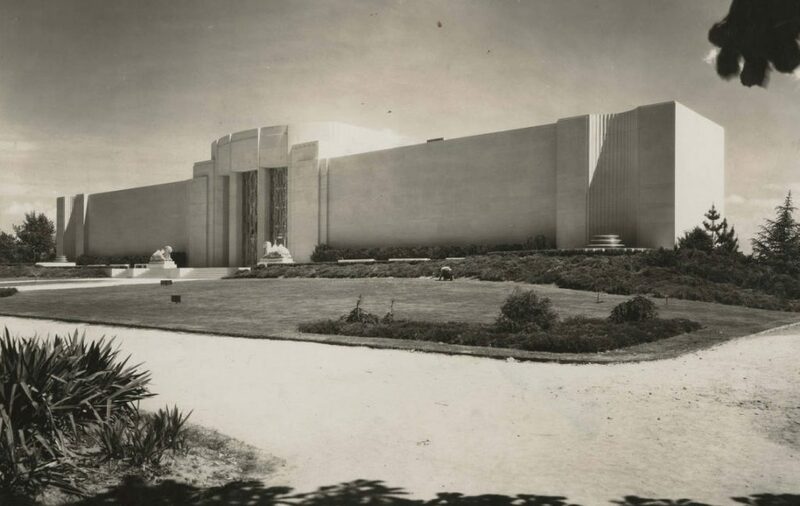 On June 23, 1933, the Seattle Art Museum opened its doors in Volunteer Park. Richard E. Fuller, president of the Art Institute of Seattle, and his mother, Margaret (MacTavish) Fuller, generously gave the museum to the City of Seattle as a gift. The museum in Volunteer Park was designed by Carl F. Gould, who was head of the University of Washington’s School of Architecture and principal architect of the university’s “college gothic” buildings, including the spectacular Suzzallo Library.